Frankie and Clover's Strictly Come Dancing Blog! : Ballroom and Banjos! You know how when Strictly couples finish a Charleston and they're panting and can't speak? Well this is what this 2-hour-15-couple extravaganzas do to us bloggers. 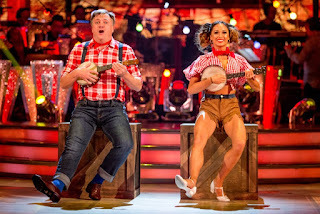 Come with us as we wade through a never-ending saga of dances and drama...oh yeah, and Ed Balls on a banjo. So a week after the semi-tango, costume disaster, we get a classic cha cha tune and suitably camp outfits, so I was breathing a little easier. Joanne warned us on ITT it was going to be fast, and my word it was! There was a bit of faffing, but minimal compared to last week, and the braces move was pretty impressive anyway - you've got to have balls to do something that could so easily go wrong. Len was right, it lacked a bit of polish, but it was ambitious and pretty well executed. We know Ore can sell a dance, I now want to see him do some classic graceful ballroom. Claudia looking delightful, AJ looking like he's dressed for one of Anton's latin numbers. A waltz isn't exactly the most exciting of dances, but I have to say I found it really irritating. There was some basic waltz in there, but it just seemed really light and nothing - I'm not very impressed by seeing an Olympic gymnast being spun around on one leg. Vastly over-marked. Sorry to be mean to the little ones, but it didn't float my boat. Lesley looking stunning, proving women over 50 don't need to look frumpy (someone should tell Louise). This was as hilarious as I was expecting, and then some, oh that super-gurn from Lesley was a treat. There was a bit in the middle where it looked like it went wrong and Lesley reminded me of Mrs Overall from Acorn Antiques, but I'll let that slide. Anyone who can hold their own while Anton gyrates in a pair of sequinned pants deserves to stick around a while. Greg is dressed as the Riddler, while Natalie is some sort of Strictly Incredible Hulk. The song kind of worked, and the fact that Greg danced to a song called Jump and only jumped once is practically a miracle in today's world of SCD. Britain's most discussed bum was noted, but I feel like we should remember it is week 2 and he has no experience. Lots of other good points to comment on there, including the routine from Nat and the level of performance and focus he had. This was always going to be a good dance for Tameka, and she certainly brought the cuteness and character they needed to carry this off. I was pretty impressed when they made a mistake and she was right back on it in half a beat. Although, saying that, I wasn't wowed by the routine, especially not in the way that the paso hit us last week. People complained about Tameka's shoes, but I was more bothered that Gorka's tattoos did not mix well with the Victorian bathing costume. These two looked like a million dollars, taking away from any need for props or excessive theme-ing. Laura even managed to look suitably placid, with a good top line in hold. However, there was a whole section in the middle where it looked like Giovanni ran out of waltz choreography and just decided to fling her about a bit. They may have to do some work to make sure they don't get forgotten among all the others. After last week's serious lack of cha-cha, and despite the Most 90s Song Ever, this at least looked like it was a tango. However, because there wasn't any eyes-and-teeth potential, it did show up that Melvin isn't that great. He'd obviously worked hard (and was doing a proper concentrating face) but there were issues with hold and posture that you couldn't help but see. He seemed more comfortable with faffing around with a luggage rack - I fear these two could be first boot. Now, there isn't really a lot you can do with this dance, but I don't think the world was crying out for a contempo Viennese Waltz. Once they finally got round to getting in hold, it was very nice, as you would expect. Although oddly skippy in places. I also understand that Louise said she didn't want to wear skimpy outfits, but her dresses are so bad people are talking about them more than her dancing. Also, it's not like you do a VW in hotpants! Well this was a hot mess. I do wonder what the original routine looked like, because this was a bit lacklustre (although from looking at Anastacia's face you couldn't tell, she knows how to work it to kingdom come). Clover thought the song choice was up there with the worst ever, I really think we have seen worse. Brendan jumping on a box of Terry's All Gold was a highlight too. Let's face it, she isn't going anywhere this week, so they can power through. The rehearsal footage of this actually looked quite promising, and Ed managed to deliver on the night. The swivel only came into play halfway through, but better than losing it during the routine. And props to Katya for giving him an actual Charleston routine, with plenty of steps to grapple with - something only Bruno managed to comment on in the judges' comments. I've been intrigued about Naga doing the cha cha all week, a fair few people have been worried she'd be a bit stiff. But my word, that makeover helped give her some sass that we haven't seen before, and probably helped her performance. The routine and song were classic cha-cha, which was really nice to see. A bit tentative in places, and like Darcey said, you could see the concentration, but again, WEEK 2 PEOPLE! After the TV-shattering assault on our senses that was last week's cha cha, it was good to have a look at some ballroom. Although even then, it was still a bit...high-octane? But it was clear some work had gone into it, and he was very good in hold, I actually want to see more ballroom from him. Also loving Oksana as Prom Queen Barbie. Now, Danny's cha cha left me pretty cold last week, and Oti wandering around with a hold-all did not get this off to a good start. The bits of this that were in hold (eg an actual Viennese Waltz) were very good and I was quite impressed with the top line etc. However, there was a lot of annoying faffing going on, that actually just highlighted his ringer-ness.